Google Pixel 3 phones promise best ever cameras and AV upgrades | What Hi-Fi? Google wasted no time at its annual Pixel event this evening, announcing the new Google Home Hub smart speaker, the Pixel Slate tablet and a new Google Chromecast. 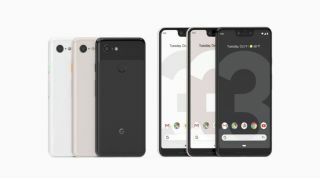 But the main event was was of course the company’s much-speculated, vastly-leaked, third-generation Pixel smartphones. Google drew the curtains on its all-new Pixel 3 and Pixel 3 XL flagship smartphones, and it’s good news in terms of AV improvements, with the handsets boasting bigger screens and claiming improvements to the built-in speakers. The new Pixels sport OLED screens, both of which are larger than their predecessors’ displays - the Pixel 3 has a 5.5in display (up from 5in), while the Pixel 3 XL’s is 6.3in (up from 6in). They don’t just have bigger screens but also a bigger screen-to-body ratio thanks to even slimmer bezels. That said, they don't appear to differ in the size from the Pixel 2 and Pixel 2 XL. Compared to the Apple iPhone XS Max, the Pixel 3 XL is tiny bit narrower but slightly taller. In terms of audio quality, Google claims the Pixel’s speakers (apparently designed with the help of an Award-winning engineer) go 40 per cent louder and deliver a "richer sound". As with the Home Hub, Google is offering six months of YouTube Music Premium free with the new Pixel smartphones. The "world’s best camera" combines AI software and hardware, with several new features designed to help users take the best photograph no matter what their conditions. With HDR+ and zero shutter lag, the Pixels’ cameras automatically snap multiple shots a second and choose the best one. There’s an AI-developed Night Sight mode for taking photos in low-light conditions when using a flash is not convenient (or permitted! ), and a Group Selfie Cam that features an extra front-facing snapper that “can capture 184% more of the scene than the iPhone XS”. Fighting talk. Super Res Zoom shoots multiple bursts of frame, with each one slightly different allowing for any rogue hand movements. Naturally, Google Lens is built into the camera too, allowing users to pull up information on what they’re shooting, whether that be a movie poster or a landmark. With the new Pixels come the Pixel Stand (£69), the “smartest wireless charger ever”, which can charge through phone cases and adjust the screen’s UI to make it more easily readable across a room. The wireless charging has been made possible by the new Pixels’ all-glass backs - although their chassis still have a two-tone glossy/matte finish. Both new Pixels also have some nifty call features, such as flagging spam calls so you can block them or even automatically answering calls for you. Both new Pixel smartphones are available in Just Black, Clearly White and Not Pink colour choices, and can be pre-ordered on 11th October. The release date for the new phones is 1st November. As for retail prices, the Pixel 3 starts at £739 for the 64GB version, while the Pixel 3 XL costs £869.